Is your computer yelling for help, but you just don't know where to turn? Look no further, The PC Doctors are here to give aid to your sick computer. We understand what it takes to cure you computer from annoying pop ups, spyware & adware, viruses, freezing, slow speeds, and much more! These days, most people’s homes and offices are becoming a virtual “rat’s nest” of various computer-based technologies. Now there is a service that can help you tame your computers and networks, and help you get (and stay) out of trouble. Why struggle with firewalls, PC upgrades, installing new equipment, and repairing network problems? The PC Doctors can help you with all of this and much more cost-effectively, with on site computer service. Our experienced Doctors have a wealth of knowledge and skills, and their mission is to help you get the most benefit from your technology investments, now and in the future. When critical systems go down, we can get you going again. Best of all, The PC Doctors work with you at the level you need. If you are a computer novice that needs help with everything, or a seasoned PC veteran who just doesn’t have the time to deal with it yourself, we will tailor our home and office computer services to meet your needs. We’re happy to help you keep your small business IT environment running smoothly, too. Just like a regular doctor and his patient, we will treat your computer as just that by doing all the checks necessary in determining exactly what is making your computer perform below your expectations. We understand people have a busy schedule, so we will make our best effort at fitting in an appointment at your best convenience. Whether its a house call or drop-off, we're sure you will enjoy our service. *Only applies if job is contracted. Otherwise a nominal fee of $19.95 applies. **$3.00/10 miles applies if outside of the downriver area. Please click here for a full breakdown of our Service & Rate Plans. "You guys not only are quick and honest, but you take the extra time to actually inform us on how to prevent the problem from arising again in the future. I feel so much more secure using my computer now. Far better than any Best Buy or Circuit City could provide!! Thanks so much Perry." "We've had an on going contract with you for over 5 years and have nothing but great experiences. From building our website and maintaining it to being on call for any of our computer problems, you've been superior to any other services we've used. You run an honest, professional business and know how to properly treat your cliental. Thank you greatly for your years of help to us." Click Here to Read What Our Clients Have to Say About Us! 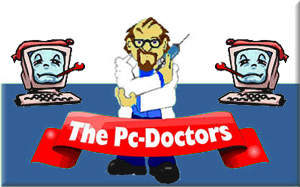 The PC Doctors - supplying the Metro Detroit & Downriver area with quality PC, Internet, and network technology services, repair and support for home and small business customers.